“Dual-language programs have been growing in popularity nationally for several years now, spurred on by demand among native speakers of common languages as well as monolingual English speakers who want all the benefits that come from bilingualism. In Boston, however, it has taken a long time to get enough people—and the right people—to agree Haitian Creole deserved to join Spanish in the public schools’ dual-language program. And it wasn’t only district administrators who had to be convinced. The Haitian community wasn’t entirely on board, either. “…changes in educational structures can have dynamic effects on entire economies. A list of the richest countries in the world is dominated by open, trade-driven economies. Oil economies aside, the top 10 includes countries where trilingualism is typical, like Luxembourg, Switzerland and Singapore, and small countries like the Scandinavian ones, where English knowledge is excellent. 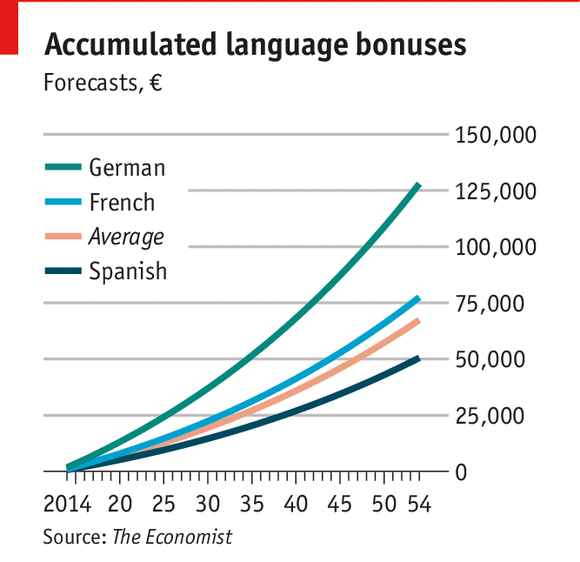 Source: Language study: Johnson: What is a foreign language worth? | The Economist. The United States used to take a much friendlier view toward bilingualism. In the 19th century, immigrant communities maintained — and even published in — their native languages, and educational policies were generally tolerant of this linguistic diversity. However, ideologies began to change in the 1880s, with a huge influx of non-English-speaking immigrants and developing reactionary nationalist movements. Eventually, this change in ideology led to a movement of “Americanization,” which adopted a push for English as a linguistic identifier of the “American.” As World War I raged, English monolingualism became synonymous with support for the U.S. Eventually, legislation removed foreign language instruction from most elementary schools. This lack of foreign language education for children persists to this day, despite much research suggesting that bilingualism has a significant positive effect on children’s linguistic, cognitive and educational development. The benefits of bilingualism are not just cognitive: Hebrew professor Adi Raz said that knowledge of a foreign language provides huge cultural benefits. “We don’t just teach language but also culture. By doing so we emphasize the importance of understanding the ‘other,’” Raz said. [Lauren] Franklin is a Plan II, linguistics and Middle Eastern languages and cultures senior from Sugar Land. Source: Americans suffer from inadequate foreign language education by Lauren Franklin | The Daily Texan.